waw036289 WALES (1951). 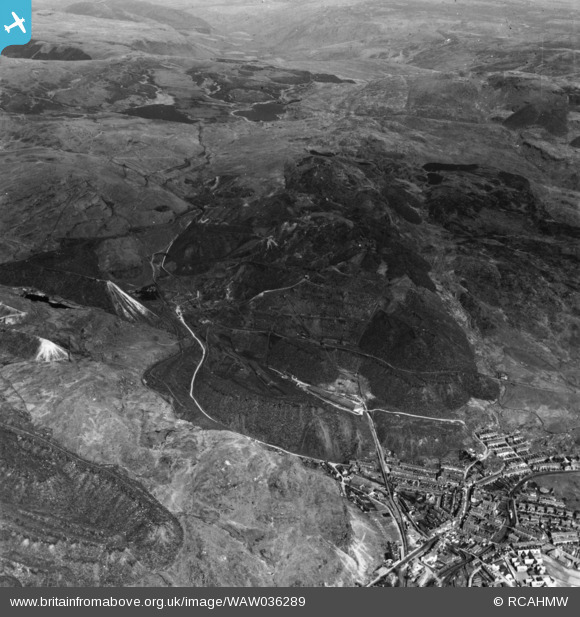 View of Oakley Slate quarries Co. Ltd., showing Blaenau Ffestiniog in foreground. Oblique aerial photograph, 5Ã‚Â½" cut roll film. Title [WAW036289] View of Oakley Slate quarries Co. Ltd., showing Blaenau Ffestiniog in foreground. Oblique aerial photograph, 5Ã‚Â½" cut roll film. Steam engine in Blaenau Ffestiniog Central (GWR) goods yard. Train approaching Blaenau Ffestiniog Central (GWR) from the south. The Ffestiniog Railway's Duffws terminus, now Listed and used as a public convenience in the car park near the preset day Blaenau Ffestiniog station.